Radio-frequency (RF) wireless communication is a significant emerging lighting control technology. In a typical hardwired lighting control system, control signals are sent using communication wires. In a wireless RF system, control devices communicate through the air using radio waves, eliminating the need for control wiring. The resulting advantages enable advanced lighting control with greater installation flexibility and lower labor installation cost, ideal for hard-to-wire applications non-accessible ceilings, hard ceilings, asbestos abasement issues, and brick and mortar existing buildings. Wireless RF lighting control first became popularized in residential applications, with typical applications including home theater, kitchens and other common areas, master bedrooms and exterior and security lighting. 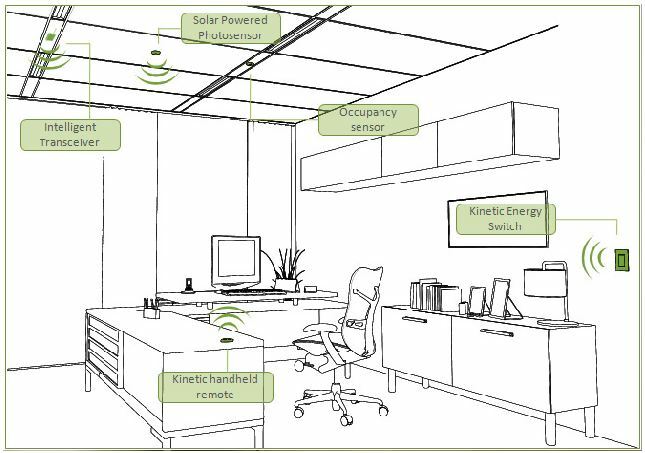 In recent years, however, wireless RF lighting control has emerged as a viable alternative to hardwired controls in commercial building applications. 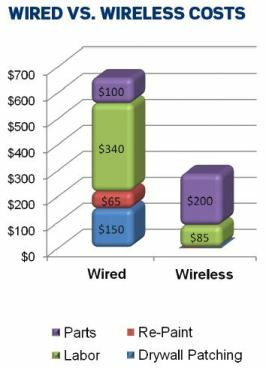 What benefits does RF wireless communication provide? The first benefit is flexibility. Wireless control devices can be placed where they are needed without limitation imposed by wiring, including areas that are difficult to wire. More flexibility is provided in unique applications. Electrical planning may be shortened. After installation, devices can be moved and the system expanded with relative ease. The second benefit is labor and material cost savings, which may result in net installation savings after the typically higher product cost is figured. Wireless control eliminates the need for dedicated control wiring and associated switch legs, traveler wires and other raw materials. The system installs more quickly, producing labor savings. With no damage to walls or ceilings, and little to no disruption to business operations, wireless control lends itself well to existing building applications demanding the benefits of advanced lighting control. The advantages of wireless control make these solutions particularly suitable for commercial building applications where the cost of running control wires is too costly or simply not possible, such as outdoor lighting, parking garages, warehouses and retrofits. 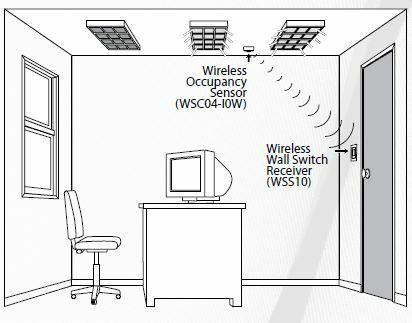 Wireless RF control devices for commercial applications include occupancy sensors, photosensors, low-voltage relay switches, line-voltage controls, plug controls, hotel card switches, shade controls, HVAC and valve controllers, door/window sensors. Despite similarities between products, various manufacturers may take significantly different approaches. In the simplest wireless RF system, a sensor, such as an occupancy sensor, communicates to a controller that controls the load, such as a wall switch with embedded RF receiver, using radio waves instead of wiring. The level of communication is peer to peer—two devices communicating within range. To extend the range, a repeater is required. Wireless control devices may be powered by batteries or through energy harvested from the operating environment. High-quality batteries offer a rated life of 10 years. Self-powered devices are available using EnOcean’s wireless RF technology. For example, the simple motion of pressing a light switch harvests a sufficient amount of energy to send a control signal to a receiver. Sensors are powered by ambient light or via temperature differences. Hotel key card systems are powered by the motion of the placement of the card into the device. More sophisticated control needs, involving a greater complexity of loads and integration of multiple control strategies, will involve larger systems such as mesh networks. 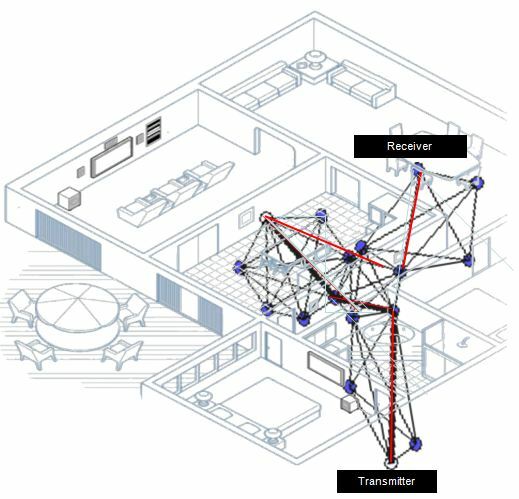 In a mesh network, control signals are passed along, or routed among, all of the wireless devices that make up the system, or network nodes, providing multiple, redundant pathways for signals to get to their intended receiver(s). As such, repeaters are not necessary. In a typical system, each device is connected via at least two pathways. If two-way communication is enabled, devices can acknowledge receipt and request retransmission of data, enhancing reliability. Communication of a robust control signal is therefore enabled via the most efficient path between devices that have no direct path to each other or are out of range. This approach makes it possible for devices with relatively low transmitting power to communicate reliably over long distances. Mesh networks are “self healing,” meaning if one of the devices is not functioning, the signal simply routes through another functioning device. This type of configuration is easily scalable. Note that configuring a mesh network is more difficult than a non-mesh network. And the selected solution should include a method for locating and identifying devices for installation, operations and maintenance. For wireless RF control devices to be interoperable within a given control system, they must be compatible with the same protocol. Today, there are four main types of RF communication protocols: ZigBee, Z-Wave, EnOcean and proprietary. ZigBee is an open-source protocol (IEEE 802.15.4) that is supported by the ZigBee Alliance of manufacturers. Vendors offering products based on the 2.4 GHz ZigBee platform include Sensor Switch, Crestron and Control4. ZigBee enables complex control functions and mesh and star networking configurations. Z-Wave was developed by Zensys, a home controls manufacturer, and is shared with partnering companies through the Z-Wave Alliance, making this protocol a de facto open standard. Vendors offering products on the 900 MHz Z-Wave platform include Leviton, Cooper Wiring Devices and Intermatic. EnOcean technology was developed by EnOcean and is shared with partnering companies through the EnOcean Alliance, making this protocol another de facto open standard. Manufacturers offering self-powered products based on the 315 MHz EnOcean platform include Leviton, Ledalite Architectural Products, Illumra and Zumtobel. Some manufacturers develop proprietary protocols unique to their products operating as part of an engineered system. 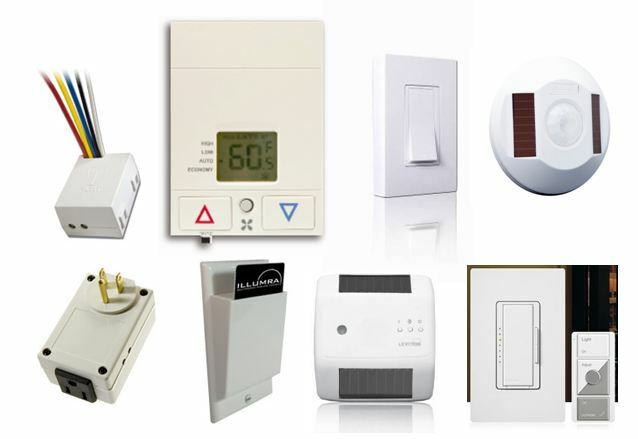 Manufacturers include Vantage Controls (900 MHz), WattStopper (900 MHz) and Lutron Electronics (400 MHz). 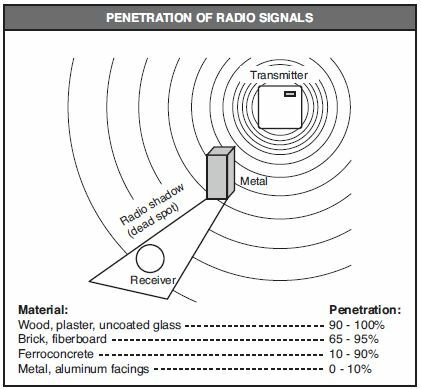 Wireless RF control devices in a network communicate with a radio range of 30-100 ft., more or less depending on whether the signal must travel through open space or obstacles such as dense walls. Range can be extended by adding devices, either repeaters or additional control devices in a network. Passing the signal through obstructions can impact range; the range given by a manufacturer as “open air” distance is not the same as what will occur in a structure. Not just physical obstructions such as walls, but the type of material in the obstruction—steel, wood, brick, cement, etc.—will affect range. Installation in metal enclosures such as a metal junction box with a stainless steel faceplate will similarly affect range. Finally, range may be dependent on what protocol is used; the EnOcean Alliance, for example, claims a range of 50-150 ft. (through walls and ceilings). A device such as an RF signal strength meter (“sniffer”) should be used to check locations for these devices prior to installation. Control devices in a wireless lighting control system work together in much the same way they would in a wired system. What is different is the way in which the devices interact and the level of intelligence required. In a hardwired system, the devices intended to work together can be simply wired. In a wireless system, the devices must be programmed or mapped to each other so they know to which control signals they should be responsive, and how they should respond. Additional intelligence is not new; it has been deployed in networked lighting systems for some time. 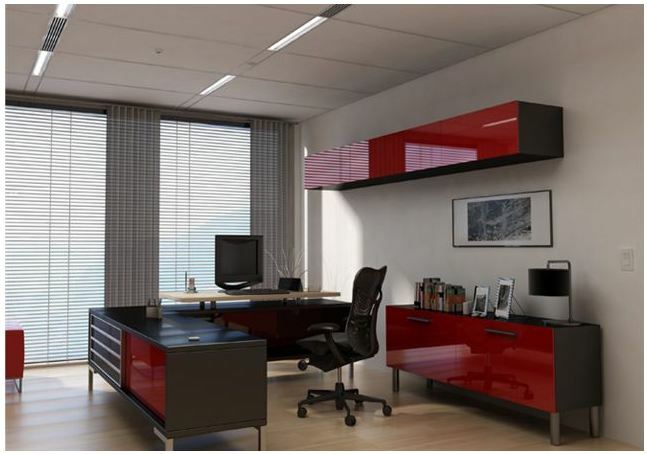 Along with the flexibility of wireless lighting controls comes some added complexity. Important questions to ask include how the devices are set up and commissioned, and by whom. It is recommended that programming be performed prior to physical installation, as the operating range is reduced during programming. It is further recommended that the wired receiver device be installed first and then the wireless device programmed within 10 ft. to ensure mapping. While wireless RF control systems may be standalone, wireless devices may also supplement, expand or otherwise interface with an existing control system. The wireless RF solution may be required to integrate with the hardwired lighting control system as well as other building monitoring and control systems such as BACnet, LONworks, Modbus, DALI and TCP/IP (Internet). Additionally, it may also be required to operate with other wireless control devices. Selected devices should not interfere with each other, should be FCC certified, and should be secure from intrusion. EnOcean modules, for example, contain a unique 32-bit ID number to prevent overlap with other wireless controls. Additionally, some wireless controls also use 128-bit Advanced Encryption Standard (AES) security for communications. RF wireless lighting controls are growing in popularity both as a more flexible alternative to hardwired systems in new construction and as an economical way to retrofit existing spaces with minimal cost and disruption. See LCA’s new online course on wireless lighting controls here. See Lutron’s offering of wireless controls here. See Leviton’s offering of wireless controls here. See WattStopper’s offering of wireless controls here.